I went to Jersey City specifically to see the Han Youngsoo exhibit. But since ICP at Mana is part of Mana Contemporary, I figured I should budget enough time to see everything else which Mana had to offer. I’m glad I did. Mana isn’t a museum per se. 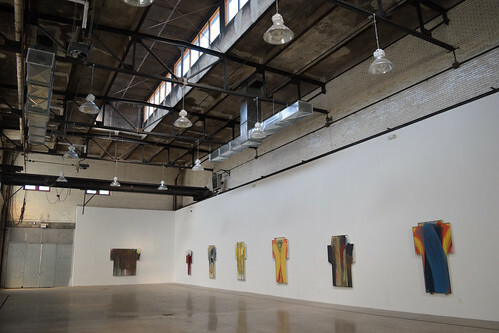 It’s an art center which offers everything from studio space to storage to crating service. The only way to see it is via a guided tour which takes you through the old tobacco factory, its industrial freight elevators, and other machinery remnants. 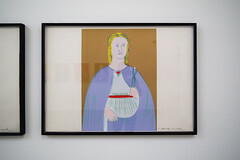 Most of the art in display is the collection of the Ayn Foundation. Very much like Pier 24 and the Pilara Foundation, Mana’s exhibitions are a way of taking art which would normally be hidden in storage and putting it on some level of public view. Ayn and Pilara are actually very similar in how their collections are extensive and show complete sets of a series rather than a single piece. 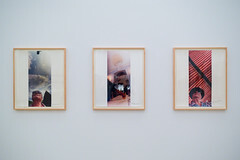 It’s fantastic to be able to see how an artist worked through a concept and the more collections and installations I see which do this kind of thing the more annoyed and distrustful I am of exhibitions which feature a single piece without context. The bad side of the similarities—aside from having hours which make it nigh-impossible for anyone who works a real job to be able visit—is how there’s a similar lack of context and explanation both in the scholarly content of the shows and in the reason why the collector purchased the pieces. As a viewer I have to bring a lot of my own knowledge to the exhibitions and make my own connections. This can be wonderful and freeing but I really do like to learn about why things are being displayed the way they are. The tour though is good. Because of the nature of the space I suspect that it’ll always be a small group (just me and one other person plus our guide) and as such it’s not a docent “let me describe this” kind of tour but instead a “let’s check out this space and I’ll give you a brief intro and feel free to ask me any questions as you take as much time as you want” thing. There’s still a bit of external pressure to keep things moving so, while I did get to check out Han Youngsoo on the tour, I went back later* to go through a second time at my own pace. *ICP has independent hours from the rest of Mana and does not require a tour. The Arnulf Rainer pieces are either vibrantly-overpainted religious images or cross-shaped canvases with similar painting. My tour guide insisted that Rainer didn’t see them as inherently religious but I’m not sure I completely buy it. They are a lot fun but the real draw is the room. It’s a huge space which, based on the overhead crane, used to be for loading and unloading. Now, with the white gallery walls and high ceiling, it feels like a chapel. Aside from the lack of light, the pieces work perfectly in the space. Yes, they’re religiousish but here they also suggest how the language of religion works architecturally to suggest that we should be pensive and quiet and respectful. The Warhol room was a ton of silkscreen prints—many of which are the iconic ones of Marilyn Monroe, Mao, and the Flowers. It was wonderful to see so many prints from the same series together. All too often there’s only one or two; here there are like nine or ten. As a print geek I loved being able to closely study how he changed things between editions. It’s not just playing with color. Sometimes a screen will be double struck. Other times a screen is omitted. Othertimes it’s flipped or rotated. Seeing the different combinations is a joy and reminded me of what Vlisco was doing. I wish that I knew the order in which they were printed because it would be awesome to learn how Warhol progressed through color and screen variations. 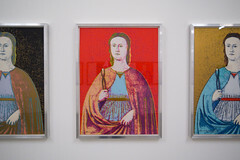 This exhibition also included a number of Warhol prints which I’d never seen before. His darker material—not just the skulls but the Sing Sing electric chair—was particularly striking. And his most-recent prints of the sunsets as well as his abstract diamond dust shadow prints were also unlike any other Warhol’s I’d seen. The diamond dust ones in particular play with texture in a way that expanded my understanding of silkscreening. 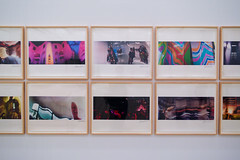 Many of the prints include solid color sections which consist of three or four different hits of the same color of ink. Not all the hits use the same screen though and the different thicknesses of ink create a textures surface to the print. Matthias Brown, Falling Faces, 2017. In the basement of the Mana building are a ton of artist studios as well as a number of artist residencies. The result is a casual art/work space with a number of improvised exhibition spaces. Surface was one such exhibition and consisted of taking GIF artists and giving them the opportunity to create animations for a gallery setting. The results are interesting—some hits and, as you have to expect with contemporary art, some misses—but the whole show is quite charming. These are artists who typically do not make physical things and so seeing their first forays into a physical, interactive space reminded me of being in school and experiencing the joy of making your first physical art object. I particularly liked creating a whirlpool with a spinning stir magnet instead of screwing around with pumps and plumbing. I also enjoyed how Matthias Brown’s piece involved projected animation interacting with static images which he’d painted on the screen itself. Another residency/exhibition is Apostrophe NYC* in the Mana BSMT. This is a dozen or so artists working together, making their own art, but also sharing a space and bouncing ideas off of each other. While their art is neat, I most-enjoyed poking my head into their studio spaces, seeing how they create things, and what kinds of random stuff they have up on their own walls. *Who got a bit of press last year for their guerrilla Whitney show. It’s been a long time—too long—since I’ve been in a space like this* and I’m glad I had the opportunity to take the tour. I’ll definitely be looking forward to future ICP shows as an excuse to head back to Mana. And who knows, maybe Mana will put a show together which could drag me out there as well. *The Product Design loft at Stanford was a similar space—as was the machine shop where we all made our projects. This entry was posted in craft, Mana Contemporary, photography, review. Bookmark the permalink.